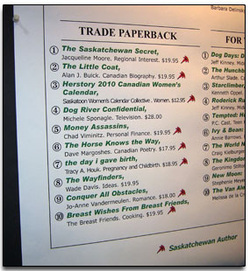 Robinson Booksellers in Saskatoon — some 75 people were in attendance. To date, The Saskatchewan Secret has sold over 4000 copies. in to talk about and demonstrate dowsing. Library on March 13, 2012.
the Meadow Lake Library's Dessert night on Thursday, October 20, 2011. Rusty Macdonald Branch Library (in the Lawson Civic Centre). Public Library in Prince Albert on October 12.
of the Unitarian Congregation of Saskatoon. “Saskatoon Book Report” show with host Ian Goodwillie. Ronge on May 5, they did three readings. at Flowers by Fred, Jacqueline read Friday, April 23, and Sunday, April 25. Aegean Tea and Coffee on March 8, 2010.
live noon–hour show, CTV Saskatoon. Writing class at Walter Murray Collegiate, December 15. CBC radio’s The Afternoon Edition to the host, Michelle Hugli.